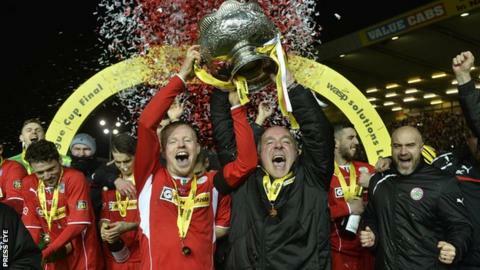 Cliftonville will start their bid for a fourth straight League Cup success when they take on Dundela next month. The Reds will host the Championship side on 2 September in one of 16 second-round matches as minnows get the chance to take a big-name scalp. Linfield entertain Glebe Rangers while Premiership champions Crusaders have a Seaview meeting with Knockbreda. Glentoran face the PSNI, Portadown are away to Larne and Glenavon will play Annagh United at Mourneview Park.